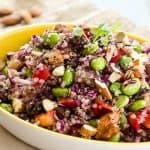 This Edamame Quinoa Salad is a delicious vegan salad that even meat-eaters will find hearty enough for a meal! It is a great make-ahead lunch for the busy work week. There is something about this time of year that always makes me want to lighten up my menus. Since I live in a climate that is pretty warm year-round, I’m not sure why this is, but it seems to happen every year. As soon as April hits, casseroles take a back seat, and I am all about salads on my menu. This Edamame Quinoa Salad is just the kind of dish that will fill you up while keeping you feeling light. I especially like it for lunch because it helps me avoid that sleepy feeling in the afternoon that I inevitably get when I eat a heavy meal. Since that sleepy feeling tends to make me reach for something caffeinated (or sweet) that interferes with my sleep, a healthy salad for lunch is one of the best things that I can do for myself to keep feeling my best. I love the texture from the shredded cabbage and almonds and the sweetness from the pineapple and raisins. It all works together to create a salad that you will make time and again. If oil isn’t your thing – it didn’t used to be mine, but I’ve embraced it now – you can make this oil-free by using chia gel in the dressing. And Swerve will substitute nicely for the coconut palm sugar if you are avoiding sugar. Just be sure to use organic Edamame, since most all non-organic edamame is GMO. And if soy isn’t your thing, just substitute chickpeas or black beans. 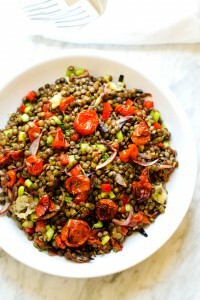 I have made it this way on several occasions and especially enjoy it with chickpeas. 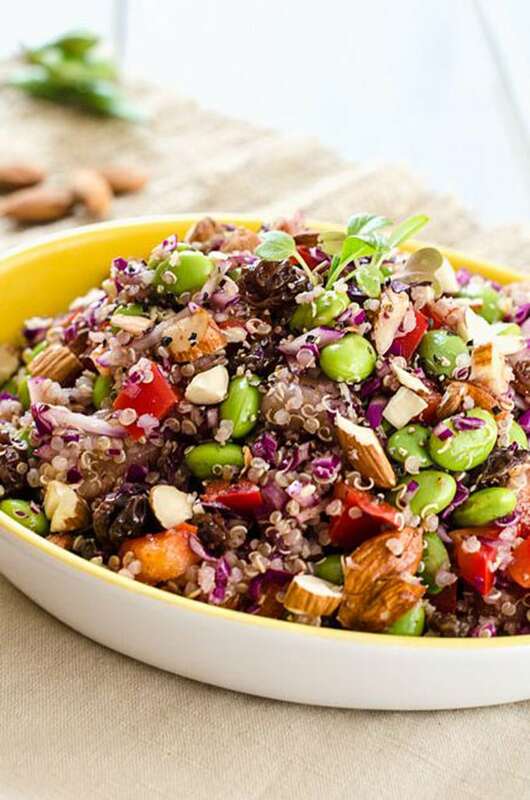 In Addition to this Edamame Quinoa Salad, you may also like these salad recipes. 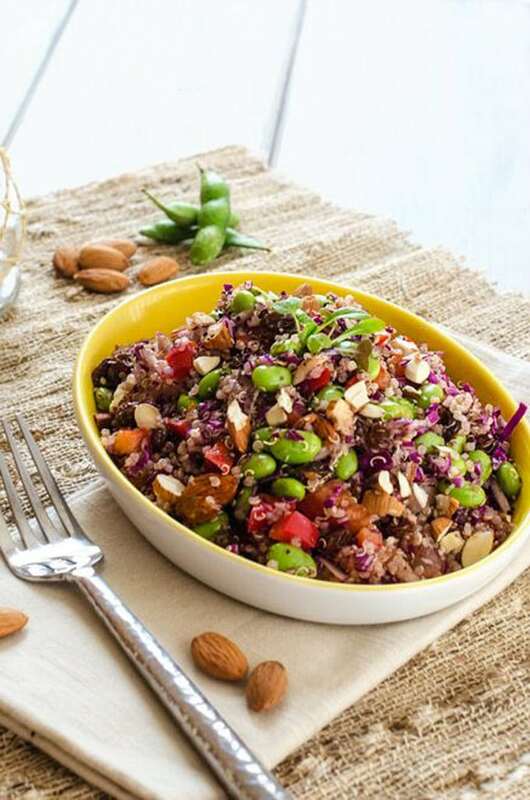 This Edamame Quinoa Salad is a delicious vegan salad that even meat-eaters will find hearty enough for a meal! It is a great make-ahead lunch for the busy work week! If using chia gel in place of oil, combine chia seeds and water and mix well. Set aside until a gel forms. 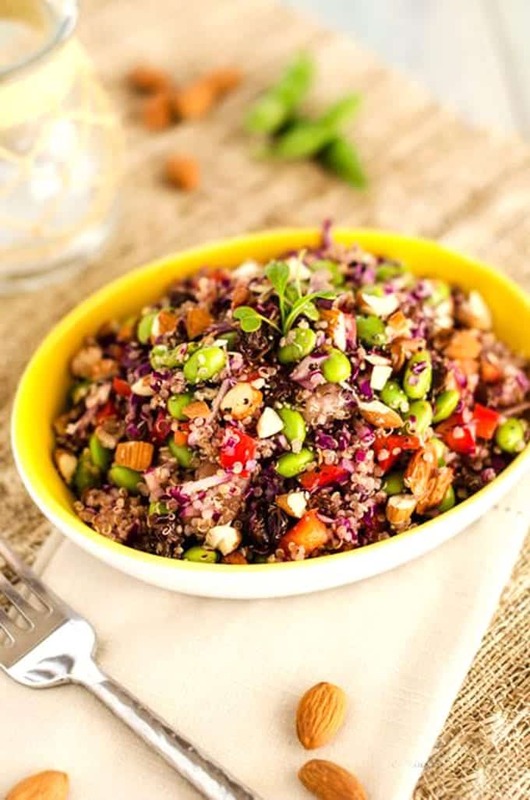 In a large bowl combine edamame, cabbage, quinoa, diced pepper, pineapple, raisins and almond. In a small bowl combine red wine vinegar, olive oil OR chia gel, coconut palm sugar, chili powder and garlic. 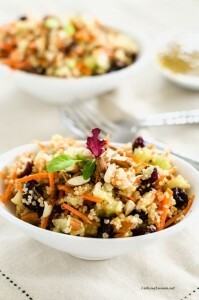 Toss with quinoa mixture and serve either chilled or at room temperature. 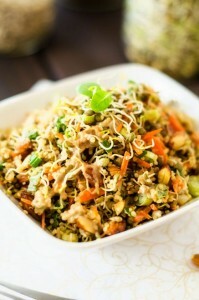 Edamame Quinoa Salad was originally published in 2013, Updated in 2017.